While they are not able to throttle you through the air, zero gravity chairs will reduce the stress on your body; elevating pressure from your rib cage and spine, resulting in the ultimate comfortable position for relaxing. The name originates from the position of an astronaut prior to blastoff into outer space. Even though the average weight of a zero-gravity chair is 20 to 30 pounds, it emulates a sense of weightlessness when in its reclined position. But with so many options available on the market, what should the best zero gravity chair have? Let’s take a look at our mini buying guide. Budget. Price is quite a deal breaker when deciding the best anti-gravity chair for you. In this case, you will be getting what you pay for. So, a simpler chair will cost less but won’t have add-ons or extra features. If ultimate relaxation is what you seek, then, by all means, invest in a higher end zero gravity chair. Weight capacity. 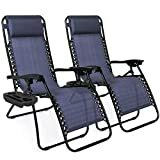 Generally, most of the anti-gravity chairs available on the market are designed to withstand a considerable figure of heavyweight. The weight capacity of the chair is always mentioned so do check it before buying. Build. The frame of a zero gravity chair makes or breaks it, literally. Metallic pipes are usually used for the support beams and frame of recliners. Other things you may want to check is whether powder coating is present. Powder coating stops the metal frame from eroding due to extended exposure to water, air, dust etc. Recline. It is extremely important that you check the product or its picture in its actual state of zero gravity position before purchasing. The angles have to be just right and not cause any bend in the user’s back. The Best Choice Products Zero Gravity Chairs are all-rounder chairs that can be used both indoors or outdoors by the pool. The material used for the seating is UV radiation resistant, which is a sigh of relief that direct sunlight will not taint the seat, a prevailing problem in several other anti-gravity chairs. Additionally, the headrests are padded. The weight capacity of each chair is approximately 300 pounds. The recline on these chairs are lockable and the elastic cords are replaceable but need to be purchased separately. We like that the products are like a mini-set. Along with the pair of chairs comes a small table. Even if you don’t plan on using the detachable cup holder that is built onto each chair, you can always have your drink or other items nearby. Like the previous product, this next product from the same brand is every bit as good as the pair of anti-gravity chairs in the review above. The only main difference is that the Canopy Sunshade Lounge Chair is singular. The UV-resistant material is used on this chair, which has a strong supportive steel frame. The canopy shade, of course, exclusive to this model. There is also a removable pillow. The steel frame and the covering fabric are held securely in place by a double bungee suspension system using heavy-duty elastic cords which are replaceable. A cup holder/tray is present in this chair and is detachable. It is strong enough to hold drinks as well as books, mobile devices, and cosmetics. The leg support is short and may be uncomfortable for tall people. The Timber Ridge Oversized XL Padded Chair has executed the perfect balance between the combination of ease, comfort, and design. Not only it is spacious with its wide recline and the headrest, there is also a drink holder. The drink holder is a great add-on, especially at the chair’s pricing. It is commendable that unlike its competitors, Timber Ridge focused on the aesthetics of this anti-gravity chair. The construction of the armrests is done by standard hard plastic but instead of being boring, it has a wooden look given to it to add sophistication. As if this wasn’t enough, the chair comes in a variety of colors so you can match it with the room you intend to use it in or with your outdoor furniture. On par with its competitors, the XL Padded Zero Gravity Chair can hold up to 350 pounds of weight which is due to the double bungee elastic cord and the highly durable steel frame. This model too is able to lock down a recline position into place. 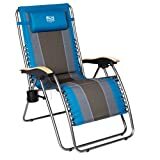 Caravan’s Sports Infinity Oversized Zero Gravity Chair is a resilient chair which can take quite a pounding when it comes to harsh outdoor conditions. Maximum comfort is ensured due to the expansion of the chair width by 3.5 inches, and the seat width by 3.7 inches as compared to other chairs in Caravan Sports lineup. 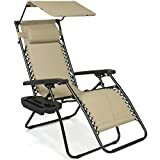 The Caravan zero-gravity chair also makes use of the double bungee cord system and a durable steel frame and is also able to hold a whopping 350 pounds of weight. This chair especially is geared towards reducing the stress and tension focused in the legs and the back. The reclining angle is smooth and doesn’t wear out over time. 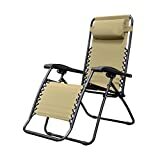 Possibly the only drawback to this chair is that it does not come in various patterns but on the brighter side, the Caravan zero gravity chair comes in sleek solid colors like blue, black, brown, and beige. Sunnydaze, like Best Choice Products, has a set of two reclining anti-gravity chairs and a table, which have used textilene material for its exterior and a powder-coated metal framing for the interior. The interior is especially long lasting as well as weather resistant. The set comes with built-in cup holders that are not flimsy at all, and also headrest pillows that are adjustable. The small accompanying table also has a couple of drink holders built in, as well as some space for other snacks or items. The recline of the chair is flawless and springs back into its original shape. The knobs placed under the armrests can be used to lock any recline position. The weight capacity of this chair is 250 pounds. If the zero gravity armchair by Sunnydaze is unsatisfactory, the manufacturer has a 1-year warranty so shop freely without any worry. 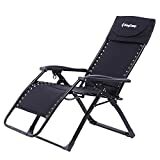 KingCamp’s Zero Gravity Chair isn’t the most popular on the market, but it does offer something different than the other models available on the market. The back of the chair and seating is made up of an extremely soft Oxford cotton cloth. The ergonomic design of this chair allows the curve of the backrest to have the largest angle for bending the knees. Speaking of ergonomics, the recline position is adjustable and lockable. The frame is practically noiseless as the foot pads and ring cushion the metal as it hits the ground. The chair can support a maximum weight up to 264 pounds and the design is easy to fold and reopen. Tall people’s ankles may hit the bar at the bottom when the chair is reclined back. 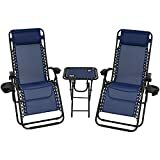 FDW Zero Gravity Chairs offer a pair of two chairs that are well made and moderately priced. 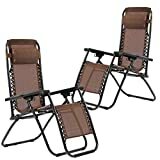 The unique selling point about these chairs is that they more or less offer the same features as some of the costlier models, plus sun shades. Since these are patio chairs, it is a great thing that the steel used for construction is coated with powder so that water and weather conditions don’t rust it out. The headrest is padded and removable, guaranteeing comfort and a good substitute for a lumbar support pillow. The maximum weight this chair can support is 250 pounds. This concludes our best anti-gravity chair review. Most of the products share key features and differ only by either the quality of construction or a few add-ons. That being said, with the mini buying guide and pros and cons listed, you will hopefully be able to select a winning chair.